Some competition for the first time the "big sea", a 20-year-old Vietnamese player caused that many players were sweating. 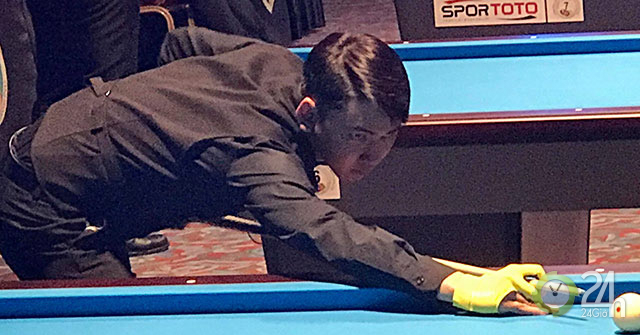 After flashes by two highly-rated players who defeated the first qualification day, the youngster Le Hoang Kim received the attention and expectations of his billiard supporters. 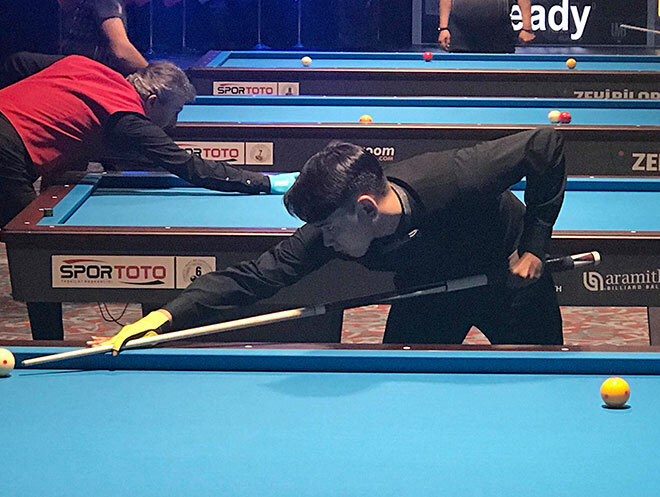 The second qualifying day was 12/2, Hoang Kim's challenge increased significantly when he was in group I with two players in the first 150 in the world. In the first match, the opponent Golden Hakan Celik, a Danish player, has 149 TG. Tay Co was born in 1999 to join the surprise operation, when he led his opponent to 8-0 after 5 rounds of first chance. However, with 13 points, Hoang Kim had 5 consecutive rounds to avoid scoring, allowing Celik to break the lead 17-14. Although he gradually regained his form in the remainder of the match, 20-year-old Vietnamese Vietnam could not catch up with the opponent, losing thus a score of 25-30 after 21 turns. This defeat forced the youngest representative of the Vietnamese pot to win with a big difference in the rest of the game. However, this is extremely difficult when rival Kim Savas Bulut – the best-looking turkish handkerchief, many turmoil on Vietnamese players must "embrace hatred." The match started, Hoang Kim quickly stunned the opponent. At the serial numbers of 3-4 continuous points, a young Vietnamese mechanic created a match that led the opponent to 113 TG. Even when Bulut made a 6-point series, it was not enough to stop Hoang Kim's step to finish the finish line first and win a spectacular victory with a score of 30-29 after 23 turns. Although the next door of the Vietnamese hand is very narrow, because Bulut is still the one who has the advantage of a very high sub-difference, this spectacular victory of Hoang Kim has been praised by experts and fans. "Kim's start at the first world tournament was so good that it exceeded expectations. 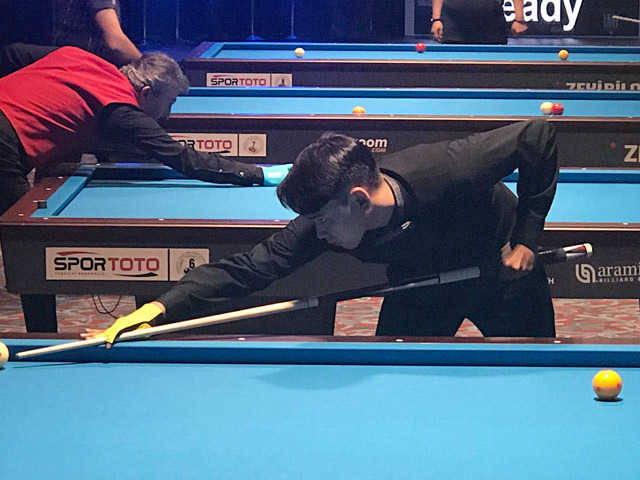 As long as it accumulates more experience thanks to continuous tournaments, I think it will be much better" – said Nguyen Viet Hoa – Vietnam billiards coach. In addition, players Le Thanh Tien (class 141 TG) playing today also stopped with 1 draw and 1 defeat. Tomorrow 13/2, three veteran Vietnamese billiards tables will die, including Do Nguyen Trung Hau (position 48 TG), Nguyen Duc Anh Chien (position 58 TG) and Ma Xuan Cuong (position 69 TG). The World Cup competition in Antalya will be held in Turkey from November 11 (New Moon Year) to February 17, gathering 165 players from around the world. All the best players in the world are present in it. Recruit Vietnamese billiards to participate in 10 athletes. The winner of the tournament will receive a prize of 16,000 euros (420 million VND) and 80 bonus points. Will he say "lifetime clerk"?